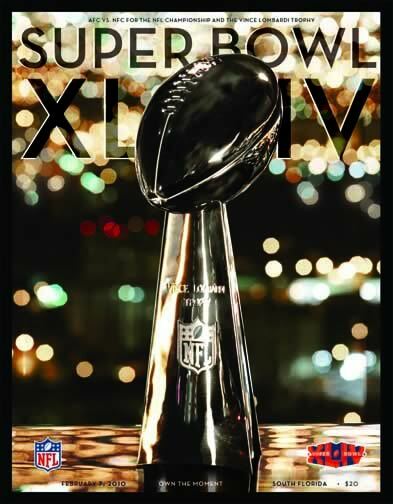 My Super Bowl XLIV program was fresh from Miami ! Just wanted to say a big thank you to a Vikings fan who was hoping to see Favre and Co play in Super Bowl XLIV, and instead had to go to Miami minus his beloved Purple People Eaters. Scott Olson is a dear friend who is in my Action PC Football leagues, and is also the man that kindly picked me up a copy of the Super Bowl XLIV program from Miami itself. Despite the disappointment of having to watch the New Orleans Saints lift the Super Bowl for the NFC Scott remembered to purchase a program for me. I know Scott ended up having a good time in Miami, trust me it is very hard not to, but I am grateful that he grabbed me a sparkly covered program. It only arrived today so I have only had a quick flick, but I have already read a great article about Super Bowl memorabilia, and discovered that Santonio Holmes gloves he wore to catch the winning touchdown in Super Bowl XLIII fetched $70,000 at auction. Scott also added some local Minnesota newspaper sports supplements – they will be a great read as I commute on the train over the next few days. Thanks again Scott and I hope for your sake that Favre comes back for one more try at the object on the front of the program above. Anyone else watching the Madden Challenge on Rush HD TV?